I fell in love in Madison, Wisconsin. In the midst of tumbling snowflakes and gassing up my cherry red VW Cabriolet convertible, I saw the great love of my life through clear eyes and for a single, perfect moment, saw what my life would become. However, that moment was a million years ago. Okay, ten, but it still feels like I was almost another girl then–one who didn’t mind sleeping on couches as a means of travel. In the time since, I’ve become spoiled in my soft-hands existence. A weekend away would require culture, cuisine, and craft cocktails. I wondered what this college town would have in the way of an adult getaway. For this journey we stayed at the brand new HotelRED, located right across the street from historic Camp Randall stadium. 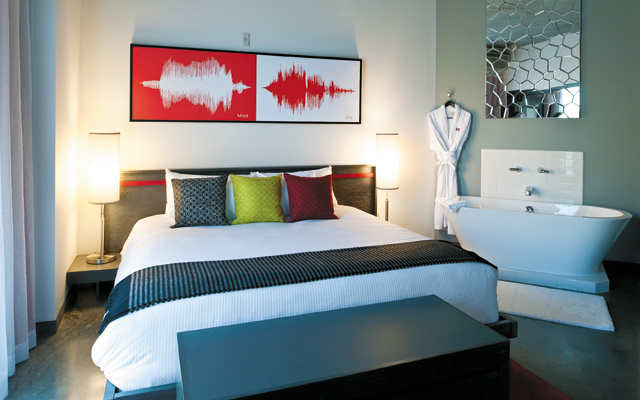 It’s a stylish spot with floor-to-ceiling windows, red and white accents mixed with industrial touches like poured concrete floors and gleaming silver fixtures. We were greeted with a refreshing little vodka-spiked fruity sipper. An adorable little dachshund shaped toy and bowl of Milkbones welcomed canine guests, a note for the dog owners out there. Our room featured a plate of cheese and berries, while the space was lightly perfumed by Aveda products. All of the rooms are suites. Ours had a bathtub in the bedroom and a shower that functioned like a full-body bidet, no cranny left unclean, like being showered with liquid fireworks. 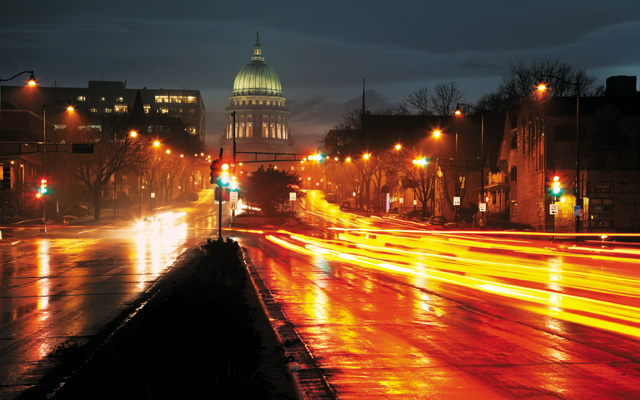 Parking in Madison is a challenge, so it’s best to leave the car and hit the streets on foot. Walking through the expansive campus of the University of Wisconsin-Madison with the stunning views, it’s fun to see the castle-like former armory decked out in rainbow gear, home to the GLBT student center. Wandering downhill leads to State Street, packed with great shops, tons of restaurants, and the Madison Museum of Contemporary Art. Open most days at noon, the museum doesn’t charge an admission fee. After taking in the eye-popping art, those lids might get a little droopy. Best to hike over to Michelangelo’s, an independently owned coffee shop known as a touchstone for the Madison gay community. Eventually, we had walked enough to justify more cheese (cheese and beer are never far when in Wisconsin, and oh, do I love them for it). The must-stop shop for serious cheese eaters is Fromagination. Opening the door, a waft of funky awesome stank of artisan cheeses invades the nose. Inside, all kinds of cheese accoutrements are found: jams, sauces, confited wonders, and bourbon-aged maple syrup. The expert staff is quick to help. Grab one of their sandwiches made with these divine ingredients for a little lunch treat, but save room for dinner. Merchant is successfully blending local food in a chef-driven menu with dazzling craft cocktails. Famous for their Merchant burger–the beefiest burger I’ve ever encountered–the chef grinds their meat on site. The creamy-centered burrata is made on site from fresh-pulled mozzarella. Merchant features the very first craft cocktail bar in Madison. 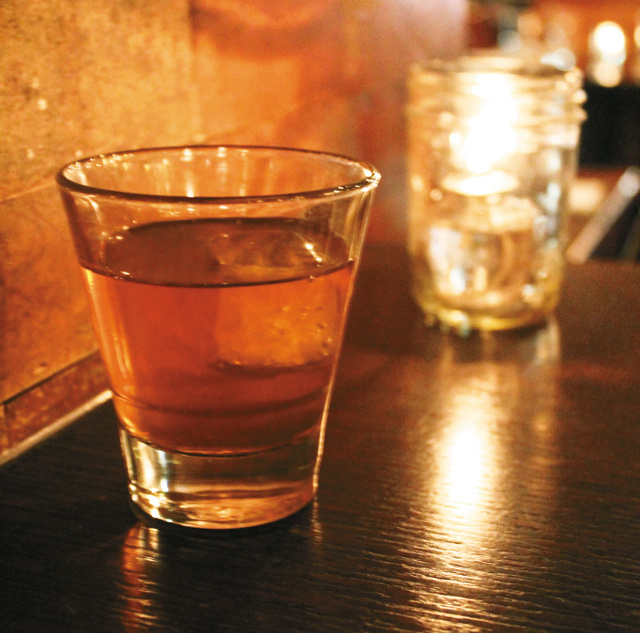 Managed by JR Mocanu, their bar chefs are layering flavors in all kinds of intriguing ways. Mocanu has been bartending since the tender age of 18; all he has ever wanted to do is make great drinks and he is definitely doing it. Another can’t-miss cocktail spot is the newly opened Corral Room hidden under the old school Tornado Room Steakhouse. This is the sort of joint where you’re likely to meet a Don Draper or Joan Holloway type over icy martinis. Upstairs, they serve a proper wedge salad, dripping in blue cheese beside a sizzling filet mignon. Downstairs (entrance is around the corner, in back), is like a hip party held in your grandparents’ basement. The vintage record player spins 45s like the Ronettes. 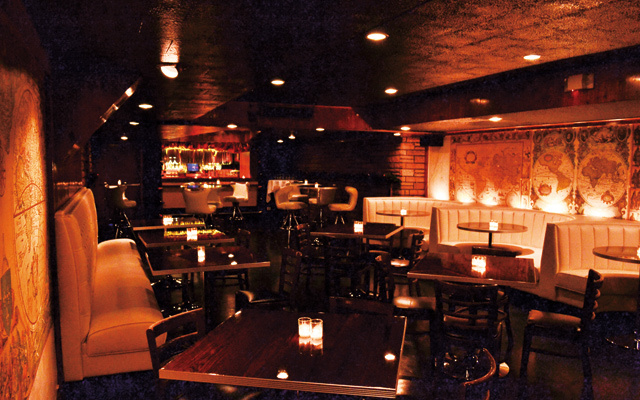 The walls are plastered with vintage maps and the bar stools are elegant, white, and deliciously soft. Morning always comes too soon and, if you hit up all the cocktail spots like I did, there’s nothing better than a proper greasy spoon to cure what ails you. The best in town is the fantastically affordable Mickie’s Dairy Bar, located directly next door to HotelRED. They only take cash, so come prepared. The peppery corned beef hash and the mammoth pancakes will chase away the demons. Before leaving Mad-town, you’ve got to try a little taste of Michael’s Frozen Custard. Proudly gay-owned and full of creamy, sweet flavor, it’s a perfect dessert to a decadent weekend in a town impossible not to fall head-over-heels for.